In 1971, Siegfried Linkwitz published "Improved Headphone Listening" in the December issue of Audio magazine, (a scanned version of the publication is linked from Improved Headphone Listening - Build a stereo-crossfeed circuit). The objective of Linkwitz' article was to reduce distorted spatial reproduction when listening to recorded stereo music with headphones-the "super stereo" effect where the music seems to be coming from inside one's head. To remove the spatial distortion, Linkwitz reasoned that a small portion of a stereo channel's signal should be fed into the other channel-and presented arguments on the frequency contouring of the required crossfeed. There is a recent Addendum on this page that describes software that implements the spatial distortion reduction scheme outlined on this site-it allows a RIFF/WAVE format selection from a music CD to be "digitally re-mastered" for use with headphones. It works especially well with portable high capacity CD/MP3 players. At half wavelengths longer than the spacing spacing between the ears, directional characteristics of speakers are reduced, and the sound waves will diffract around the head; stereo characteristics can not be reproduced, and each ear will hear about the same sound intensity from either speaker. where v is the velocity of sound, which is about 1100 feet per second. were w' is twice the distance between the ears, or about a foot, or Fl = 1100 Hz. This means that the low frequency listening environment for speakers can be approximated with headphones by crossfeeding about a factor of unity of the opposite channel's signal into the other channel-about doubling the sound intensity below Fl. Although this is an approximation, it is reasonably close to the value used in other designs-Jan Meier used 650 Hz. in An Enhanced-Bass Natural Crossfeed Filter, and Chu Moy used 700 Hz. in An Acoustic Simulator for Headphone Amplifiers. The original Linkwitz paper used 700 Hz., also. Assuming an omnidirectional polar response for hearing as an approximation for high frequency directional characteristics in a room with infinite spatial dimensions, (admittedly, a simplistic assumption,) Figure I, (which is available in larger size jpeg, PostScript, PDF, or xfig, formats,) shows a standard for stereo music listening where the speakers are 30 degrees off axis. or the combined sound in the left ear, at zero degrees rotation, (ie., looking in between the speakers,) would consist of 75% from the left speaker, and 25% from the right speaker. Likewise for the right ear. This means that the high frequency listening environment for speakers can be approximated with headphones by crossfeeding about a factor 1/4 of the opposite channel's signal into the other channel, which is reduced by a factor of 1/4, such that it is still unity sound intensity. Again, this is an approximation, but compares favorably with the original Linkwitz paper which used -3db for the high frequency crossfeed signal ratio. Crossfeeding about a factor of unity of the opposite channel's signal into the other channel for frequencies below Fl-about doubling the sound intensity below Fl, which is about 1100 Hz. Crossfeeding about a factor 1/4 of the opposite channel's signal into the other channel for frequencies above Fl, which is reduced by a factor of 1/4, such that it is still unity sound intensity, above Fl, which is about 1100 Hz. which is diagrammed in Figure III, (which is available in larger size jpeg, PostScript, PDF, or xfig, formats,) is a Bode plot of the required frequency contour characteristics. Those frequencies below Fl, (1100 Hz.,) should be combined to produce monophonic sound, by summing the left and right channel inputs. Those frequencies above Fl, (1100 Hz.,) the left and right input signals should be combined to produce "near stereo"; the sound in the left ear phone should consist of 75% of the left channel input signal, and 25% of the right channel input signal. Likewise for the right ear phone. 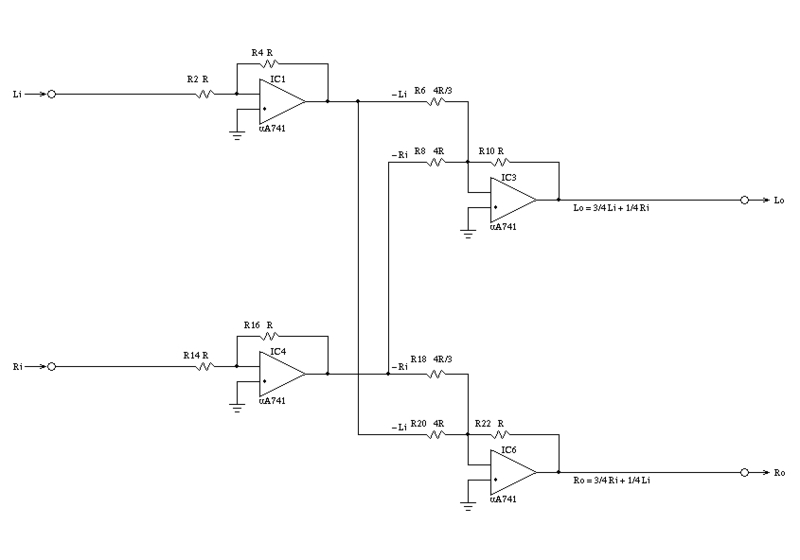 The schematic in Figure IV, (which is available in larger size jpeg, PostScript, PDF, or xfig, formats,) is a prototype circuit that implements the required frequency and crossfeed contouring. As a development objective, the low and high frequency contouring and crossfed control elements must not interact-they must be independently adjustable. 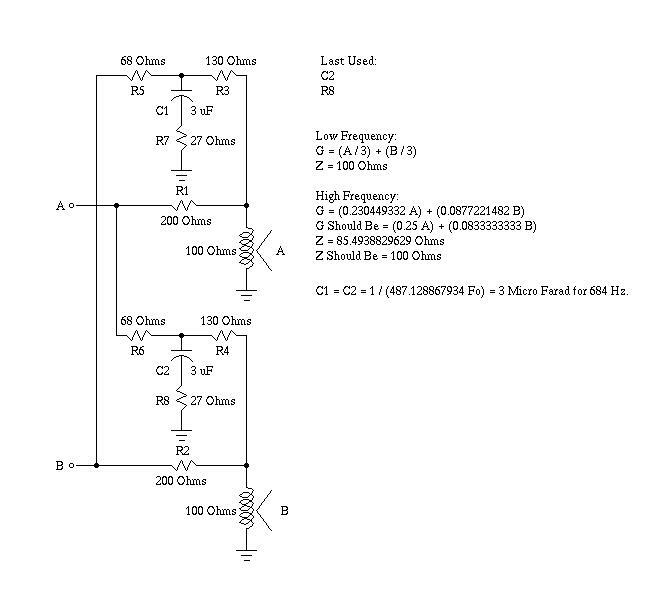 The circuit description is divided into a low frequency and high frequency analysis-below Fl, and above Fl, where Fl is the single S-plane pole and zero determined by C4-R5 and C3-R4 for the left channel, and C12-R17 and C10-R16 for the right channel. IC1 is a high pass inverting amplifier for the left channel-at high frequencies, above Fl, it has unity gain. The S-plane zero frequency is determined by the C2-R2 time constant. IC2 is a low pass inverting amplifier for the the left channel-at low frequencies, above Fl, it has unity gain. The S-plane pole frequency is determined by the C4-R5 time constant. IC4 is a high pass inverting amplifier for the right channel-at high frequencies, above Fl, it has unity gain. The S-plane zero frequency is determined by the C10-R14 time constant. IC5 is a low pass inverting amplifier for the the left channel-at low frequencies, above Fl, it has unity gain. 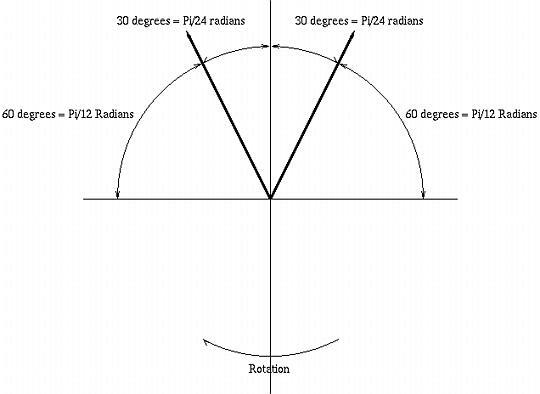 The S-plane pole frequency is determined by the C12-R17 time constant. IC3 is the summing amplifier for the left channel-it sums the signals from IC1, IC2, IC4, and IC5, with ratios that are inversely proportional to the values of R6, (the left channel high frequency components,) R7, (the left channel low frequency components,) R8, (the right channel high frequency components,) and R9, (the right channel low frequency components.) 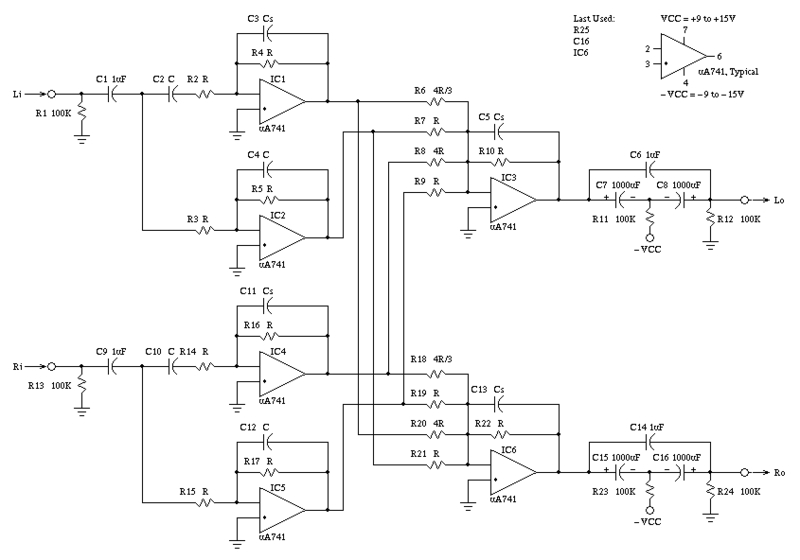 The output of IC3 is the left channel output, and is proportional to the value of R10. IC6 is the summing amplifier for the right channel-it sums the signals from IC1, IC2, IC4, and IC5, with ratios that are inversely proportional to the values of R18, (the right channel high frequency components,) R19, (the right channel low frequency components,) R20, (the left channel high frequency components,) and R21, (the left channel low frequency components.) 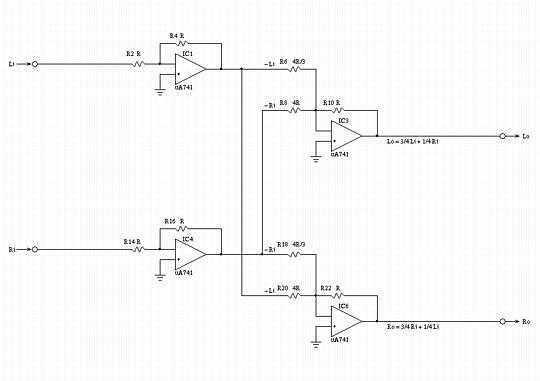 The output of IC6 is the left channel output, and is proportional to the value of R22. 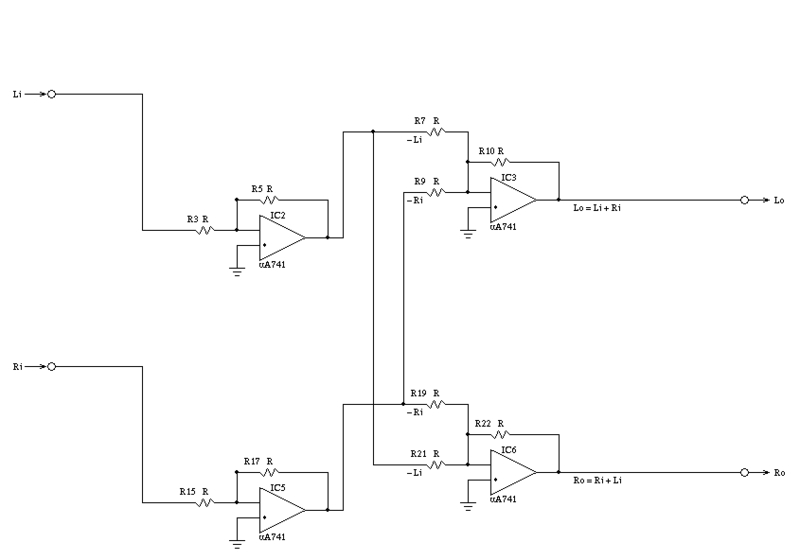 Figure V, (which is available in larger size jpeg, PostScript, PDF, or xfig, formats,) is a low frequency equivalent circuit schematic of Figure IV. and satisfies the requirement for low frequency contouring. Figure VI, (which is available in larger size jpeg, PostScript, PDF, or xfig, formats,) is a high frequency equivalent circuit schematic of Figure IV. and satisfies the requirement for high frequency contouring. 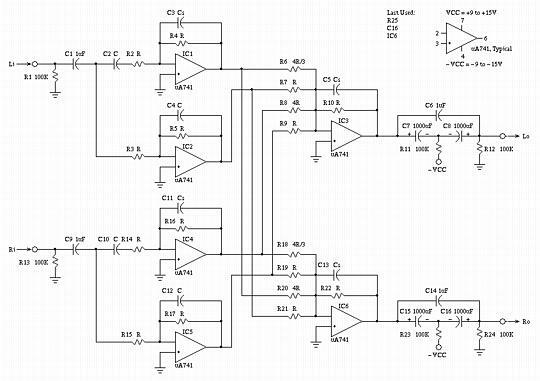 Figure VII, (which is available in larger size jpeg, PostScript, PDF, or xfig, formats,) is a passive implementation of the circuit shown in Figure IV, and has the same frequency response to within 1 db. The headphone impedance is required to be 100 Ohms, and the circuit output impedance is 100 Ohms at low frequencies, and 85 Ohms at high frequencies. 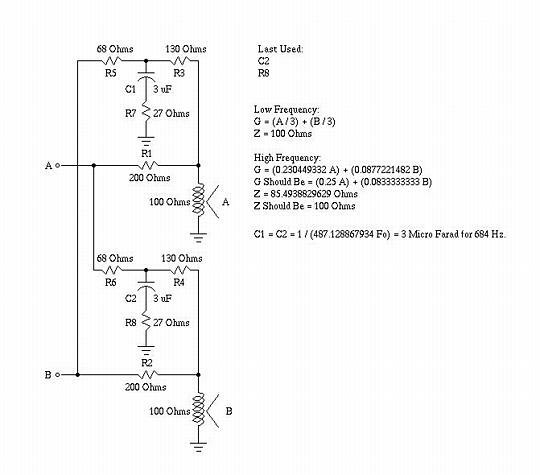 The A and B inputs are assumed to be low impedance sources, (an 8 Ohm output impedance stereo amplifier is adequate,) and the voltage gain to the headphones is 1 / 3. Figure VII, (which is available in larger size jpeg, PostScript, PDF, or xfig, formats,) is a simple RC filter that approximates the contouring functions , of the schematic in Figure IV. The concept can be implemented digitally, too, which is attractive for listening to a collection of MP3s on a portable unit-the CD music selections can be "digitally re-mastered" for use with headphones. Consider listening to a stereo system with speakers. At low frequencies, at half wavelengths longer than the distance between the ears, sound will diffract around the head and there will be no directional characteristics. So, for wavelengths longer than about a foot, (corresponding to a frequency of about 1100 Hz.,) there is no stereo effect. For frequencies below about 1100 Hz., the left and right channels can be simply added together for each headphone channel. Now consider frequencies higher than about 1100 Hz. Those frequencies have directional characteristics; if the sound from the left and right speakers are identical, (i.e., monophonic,) the sound would appear to come from a point source directly in front of the listener-for both speakers and headphones. If the sound from the left and right speakers are not identical, then they would appear to come from point sources to the left and right of a listener with headphones, (which makes the music appear to come from inside the head.) Note that it is a vector addition-identical sound in both channels appears to come from straight ahead in headphones, while different sounds appear to come directly from the left or right. To make sound appear to come from in between those directions, a fraction, the cross feed factor, of one channel must be added to the other, and vice versa. A standard configuration for a stereo system is for the speakers to be located 15 feet apart, and aimed at the listener at an included angle of 60 degrees, which provides an illusion of spatially distributed music. For example, if the listener is looking straight ahead, then the sound level of the right channel would be cos (60) = 0.5 from the right speaker, and cos (120) = -0.5 from the left speaker. 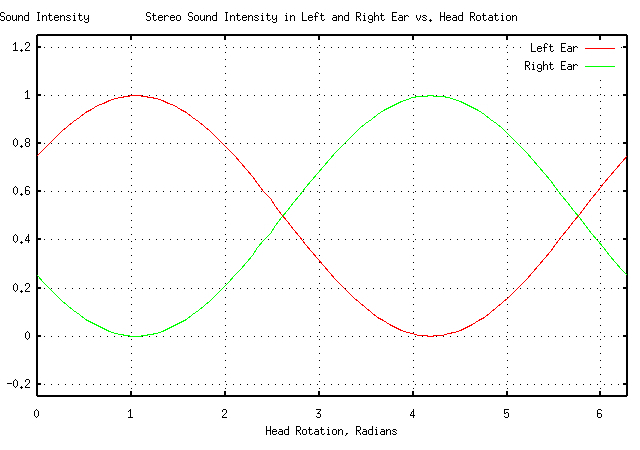 If the listener's head turns 15 degrees toward the left speaker, the sound level would raise to cos (45) = 0.707 from the right speaker and cos (105) = -0.269 from the left speaker. Likewise, sound that is balanced in a ratio of 0.707 from the right speaker and -0.269 from the left speaker would appear 15 degrees to the right of the listener, (by reciprocity arguments.) This is the stereo illusion. Most recorded music is mixed according to this model. For headphones to sound like the same stereo illusion-by reciprocity arguments-then the sound should appear to come from two sources separated by +/- 30 degrees, (or 60 and 120 degrees from the axis of the listener's ears.) Recorded music mixed such that a sound level ratio of sin (60) / cos (60) = 1.732 between the left and right speakers would produce sound appearing to come from 30 degrees off axis. Or, a factor of 1 / 1.732 = 0.577 from one channel should be added to the other, and vice versa. So as an approximate model, at frequencies below about 1100 Hz., both the right and left channels are added together for each stereo channel. At frequencies above 1100 Hz., each stereo channel has a cross feed of about a factor of 0.577 = 5 Db. from the other channel added to it-ignoring sound blocking by the head itself. To produce the single pole low pass filter at 700 Hz., the the sources from the tspole(1) program from the NdustriX, site was used. where p is a constant that determines the frequency of the pole-a value of unity places the pole at the sample frequency of the time series. The gain is adjusted by multiplying the output by 0.59 to bring the low frequency sound level back near the original. The delay in the cross feed can be altered using the -d option to the tsheadphone(1) program. The delay equivalent to 0.25 feet, would be about 300 microseconds. The delay is implemented with a ring buffer, each "bucket" representing 1 /44.1 KHz., so 500 microseconds would require 12.3 buckets, or about 13-this delay is inserted in the total cross feed, (including below 700 Hz. and above,) for both channels. can "digitally re-master" a CD music selection file, myfile.wav, for headphone usage, myfile-headphone.wav, in a single command. The NdustriX site's programs on the Utilities page are also helpful. which is useful for testing CD/MP3 players. For example, tracks/selections can be made at 18, 20, 30 ... Hz., and then the output voltage measured to test frequency response, distortion, etc. WIth a little ingenuity the CD player output could be connected to a PC's sound card, and digitized as a RIFF/WAVE file and compared with the original file using the NdustriX site's programs on the Utilities page-essentially turning the PC into a test lab. As a note in passing, headphones require a specific source impedance for correct frequency response; this can be verified with a 3.5 Mm. breakout by connecting a CD player, with a frequency response CD, to one channel of a headphone, and using the other channel as a microphone by holding the cups together, and digitizing the output of the "microphone;" if reciprocity holds true, the frequency response/distortion of the headphones can be measured-the error in response will be twice what it is for one headphone. Mismatching the headphones with an improper source impedance deteriorates low frequency response. Copyright © 1992-2012, John Conover, All Rights Reserved. Copyright © 1992-2012 John Conover, john@email.johncon.com. All Rights Reserved.